Heliodoros is ousted by Antiochos IV Epiphanes, a former Roman hostage (175 BCE). When it was reported to Rome that the colony of Mutina had been captured by the Ligurians, the outgoing consul Gaius Claudius Pulcher was immediately charged with holding the consular elections and then marching north to recover the colony. The new consuls for 176 BCE were Gnaeus Cornelius Scipio Hispalus and Quintus Petilius Spurinus. The former was given Pisa as his province, the latter Liguria. But before they could set out for their provinces, the traditional Feriae Latinae had to be celebrated on the Mons Albanus. This was an extremely important festival, which required the presence of both consuls. The festival ended in disaster this year. The magistrate of the Latin city of Lanuvium made a mistake, and the college of pontifices ruled that the festival had to be held a second time. To add insult to injury, the consul Cornelius had suddenly collapsed while returning from the Mons Albanus. Partially crippled, he travelled to Cumae to recover, but not much later he was dead. Gaius Valerius Laevinus was elected suffect consul in his stead. After some discussion, it was decided not to send the praetor Marcus Popilius to Sardinia. Tiberius Sempronius Gracchus, whose imperium had been prorogued, was doing just fine there. The previous year, he had defeated the Ilienses and the Balari, and now he continued his campaign and managed to bring the entire island back under Roman control again. The rebels were punished and ordered to pay double taxes and corn. 230 hostages were furthermore given. Sardinia had been subjugated again thanks to Gracchus’ efforts. He would celebrate a triumph in November of 175 BCE. Roman hastatus (source: Europa Barbarorum). Roman princeps (source: Europa Barbarorum). Meanwhile, the proconsul Gaius Claudius Pulcher had recaptured Mutina after a siege of just three days. The Ligurians then retreated into the mountains and began killing and mutilating the prisoners they had taken at Mutina and slaughtering the animals they had stolen. The consul Quintus Petilius Spurinus, having finished his business in Rome, now hurried north, eager to take part in the campaign against the tribes. He wrote to Pulcher to meet him at the Macri Campi – ‘Poor Fields’ – and hand over his army. A few days after this had been done, the suffect consul Laevinus arrived in the region as well to participate in the offensive. After a lustratio – a ritual purification – of the two armies, the Romans advanced on two mountain tops called Ballista and Letum where the Ligurians held out. During the assault of Letum, the consul Petilius was killed by a missile. Earlier that day, he had boasted that he would take Letum, not realising that letum capere also means ‘to die’ in Latin. In spite of their general’s death, the Romans drove the Ligurians from the position and killed scores of them. Petilius’ death had curious consequences. The regularly elected consuls were dead, and it was widely held that the law prohibited a consul suffectus from presiding over the consular elections. These elections were then presumably held under the auspices of a so-called interrex, a patrician senator chosen by the Senate who held imperium for just five days. Publius Mucius Scaevola and Marcus Aemilius Lepidus were elected as the new consuls for 175 BCE. The former was sent to Liguria to fight against the tribes that had pillaged the territories of Luna and Pisa, while latter – who was consul for the second time – was sent to Gallia Cisalpina. Lepidus had to deal with unrest in the city of Patavium (modern Padova). The exact nature of this unrest is not recorded, but it may have been that some of the native Veneti began to resent being dominated by the Romans, which led to an armed conflict with a pro-Roman faction (Livius, who was from Patavium, calls it a civil war). In any case, both Roman interventions were successful. The consuls celebrated triumphs in December, and the Romanisation of the Veneto continued unhindered. 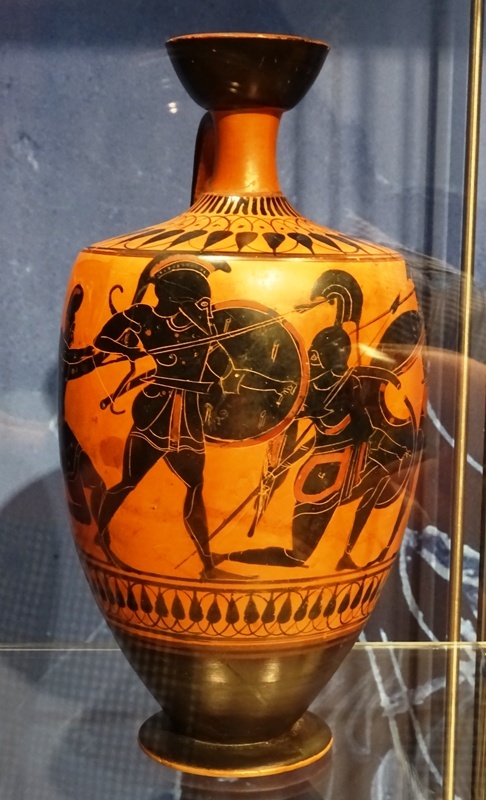 Greek hoplites on a vase (Rijksmuseum van Oudheden, Leiden). In 176 BCE, the Senate furthermore welcomed a delegation from the Dardani, a tribe living to the northwest of Macedonia. They have been identified as either Illyrian or Thracian. The Dardani claimed that they were threatened by Perseus, the King of Macedonia, who had hired bands of warriors from a tribe known as the Bastarnae. This tribe, probably of Germanic origin with some Celtic influences, was known for its bravery and ferocity in battle. The Bastarnae had started migrating from their previous homeland on the river Danube into Thrace a few years ago and this had led to conflicts with other tribes, as well as alliances with a Celtic tribe known as the Scordisci. The Romans decided to send the former consul Aulus Postumius Albinus and some young men to the region to investigate the situation. Albinus returned from Dardania in 175 BCE and reported that the area was in a state of war. The Dardani had tried to attack the Bastarnae in force when their allies the Thracians and the Scordisci had returned to their home countries, but had achieved mixed results. The Bastarnae had nevertheless decided to migrate north again, and scores of them were killed when they tried to cross the frozen Danube and the ice broke. King Perseus of Macedonia denied any involvement in the conflict. Tensions with Rome were now growing. Important events took place in the Seleucid Empire. 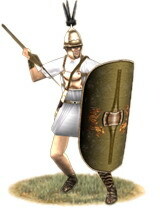 A young man named Mithridates had lived as a hostage in Rome since the defeat of his father, King Antiochos III, at the Battle of Magnesia in 190 BCE. Three years later, his older brother Seleukos had become the new ruler of the reeling Seleucid Empire. In 176 BCE, this King Seleukos IV Philopator, had sent his own son Demetrios to Rome so that his brother could be released. While on his way back to Syria the next year, Mithridates was informed that King Seleukos had been murdered. 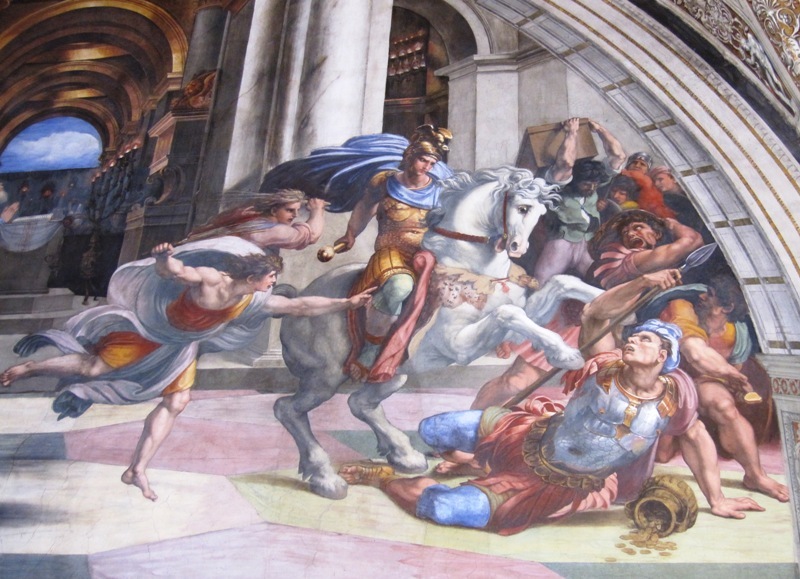 Heliodoros expelled from the Temple (famous fresco by Raphael). According to 2 Maccabees, one of the deuterocanonical books of the Bible, the king had sent his chancellor Heliodoros to Jerusalem to confiscate the treasures of the Second Temple. The action may have been motivated by the desire to pay the final instalment of the indemnity of 12.000 talents that the Seleucids had to pay to Rome (see the Treaty of Apameia of 188 BC), but this is speculation. If we are to believe the Bible, Heliodoros was then chased out of the temple by a fearsome horseman sent by God and by two strong young men on foot. Of course, it is much more likely that he was simply roughed up by the priests and worshippers when he tried to enter this holiest place for Jews in the known world. In any case, when he returned to the king’s court, Heliodoros assassinated Seleukos on 3 September 175 BCE and claimed the throne for himself. Heliodoros was subsequently ousted himself by Mithridates, with a little help from Pergamum. Under the name of Antiochos IV Epiphanes (‘The Illustrious’), he became the new ruler of the Seleucid Empire. His public appearances were often quite bizarre. He pretended to have introduced Roman political offices such as aedile and tribune, wore a toga and ran for office in his capital of Antiocheia. 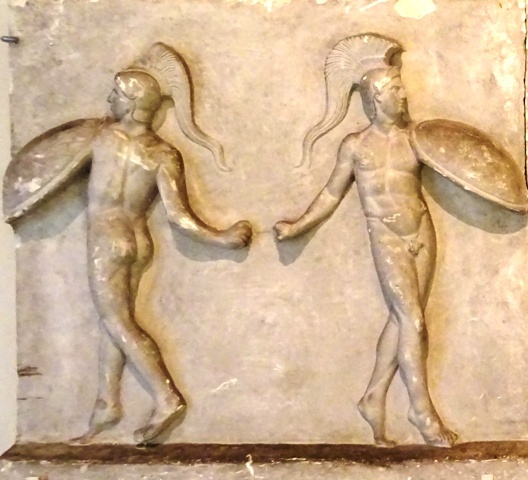 Antiochos also held gladiatorial games. It is not clear whether the king was serious, or whether his erratic behaviour was all one big practical joke. The historian Polybius called him Epimanes instead of Epiphanes. This nickname means ‘The Madman’. King Antiochos IV is remembered for almost bringing the Ptolemaic Empire to its knees in the Sixth Syrian War and for the so-called Maccabean Revolt. This revolt in Judea (in effect a civil war) was a response to the king’s attempts to Hellenise the Jewish population there. The revolt would lead to autonomy for Judea and ultimately to the Hasmonean dynasty on the throne, which was in turn succeeded by the Herodian dynasty. The Bible: 2 Maccabees 3.